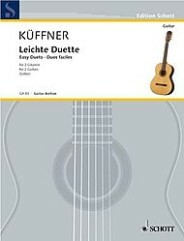 40 Easy Duets (Two Guitars). By Joseph Kuffner and Joseph K. Arranged by Walter G�tze and Walter G. For Guitar. Gitarren-Archiv (Guitar Archive). 24 pages. Schott Music #GA83.